The Ross Fluorescence Imaging Core site is under new management (May 2017). John Gibas is now with Olympus. George McNamara is now the image core manager. Prof. Olga Kovbasnjuk has moved to University of New Mexico. Prof. Bin Wu is now the image core director. Please come and see me to verify that you are registered in the new database, all your current infomation is up to date and you can actually login to use the site. Sorry for the delay and thanks for your patience. 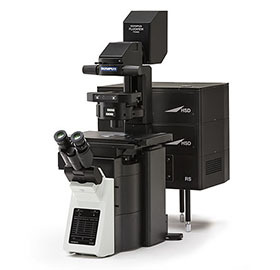 July 20, 2018: Zeiss LSM510META confocal microscope has been retired. Olympus FV3000RS confocal microscope has been funded by NIH S10 grant proposal. we expect to have 'up and using' by end of August 2018. FISHscope expected to be funded (NIH P30 G.I. Center supplement plus matching funds from us) (really: smFISHscope). Microscope delivery asnticipated "autumn 2018". G.I. single molecule fluorescence in situ hybridization (smFISH) first 30 G.I. centric probe sets development and implementation funded. (GM can also send as a Word doc).